Maternity clothing doesn’t have to be colourless, plain and boring! Purpless Maternity proudly presents a large selection of printed maternity tops that are not only extremely comfortable to wear, but also provide a little bit of fun and laughs. Show the whole world how proud you are of being a mum-to-be and make the people smile when they meet you. Having a baby is a great mood improver not only for you, but for all those around you – you just need a simple print on a maternity top to induce a little smile. Printed Tops There are 48 products. Miracle In Progress-Slogan Cotton Printed Maternity Top 2012 BlackRefresh your summer wardrobe and stay on trend this season with our stunning printed Top. Our stylish, short sleeved maternity top will be sure to make you stand out in a crowd. Skeleton-Slogan Cotton Gold Printed Maternity Top 2016G Marl Gray Melange Refresh your summer wardrobe and stay on trend this season with our stunning printed Top. Our stylish, short sleeved maternity top will be sure to make you stand out in a crowd. Miracle In Progress-Slogan Cotton Printed Maternity Top 2012 Indigo Jeans MelangeRefresh your summer wardrobe and stay on trend this season with our stunning printed Top. Our stylish, short sleeved maternity top will be sure to make you stand out in a crowd. Peek-A-Boo Slogan Cotton Printed Maternity Top 2013 BlackRefresh your summer wardrobe and stay on trend this season with our stunning printed Top. Our stylish, short sleeved maternity top will be sure to make you stand out in a crowd. Blue or Pink Slogan Cotton Printed Maternity Top 2014 BlackRefresh your summer wardrobe and stay on trend this season with our stunning printed Top. Our stylish, short sleeved maternity top will be sure to make you stand out in a crowd. Love Heart-Slogan Cotton Printed Maternity Top 2011 PlumRefresh your summer wardrobe and stay on trend this season with our stunning printed Top. Our stylish, short sleeved maternity top will be sure to make you stand out in a crowd. Love Heart-Slogan Cotton Printed Maternity Top 2011 Light Gray MelangeRefresh your summer wardrobe and stay on trend this season with our stunning printed Top. Our stylish, short sleeved maternity top will be sure to make you stand out in a crowd. Miracle In Progress-Slogan Cotton Printed Maternity Top 2012 PlumRefresh your summer wardrobe and stay on trend this season with our stunning printed Top. Our stylish, short sleeved maternity top will be sure to make you stand out in a crowd. Peek-A-Boo Slogan Cotton Printed Maternity Top 2013 WhiteRefresh your summer wardrobe and stay on trend this season with our stunning printed Top. Our stylish, short sleeved maternity top will be sure to make you stand out in a crowd. Blue or Pink Slogan Cotton Printed Maternity Top 2014 Light Gray MelangeRefresh your summer wardrobe and stay on trend this season with our stunning printed Top. Our stylish, short sleeved maternity top will be sure to make you stand out in a crowd. Purpless Maternity Slogan Print Boyfriend Fit Pregnancy Top 2201 Indigo Jeans Melange Tick all of your maternity fashion boxes with our boyfriend fit bump-friendly t-shirt. Modern silver slogan print, short sleeves and crew neck go with everything. Love Heart-Slogan Cotton Printed Maternity Top 2011 WhiteRefresh your summer wardrobe and stay on trend this season with our stunning printed Top. Our stylish, short sleeved maternity top will be sure to make you stand out in a crowd. Miracle In Progress-Slogan Cotton Printed Maternity Top 2012 WhiteRefresh your summer wardrobe and stay on trend this season with our stunning printed Top. Our stylish, short sleeved maternity top will be sure to make you stand out in a crowd. Made with Love-Slogan Cotton Printed Maternity Top 2015 BlackRefresh your summer wardrobe and stay on trend this season with our stunning printed Top. Our stylish, short sleeved maternity top will be sure to make you stand out in a crowd. Made with Love-Slogan Cotton Printed Maternity Top 2015 Marl Gray MelangeRefresh your summer wardrobe and stay on trend this season with our stunning printed Top. Our stylish, short sleeved maternity top will be sure to make you stand out in a crowd. 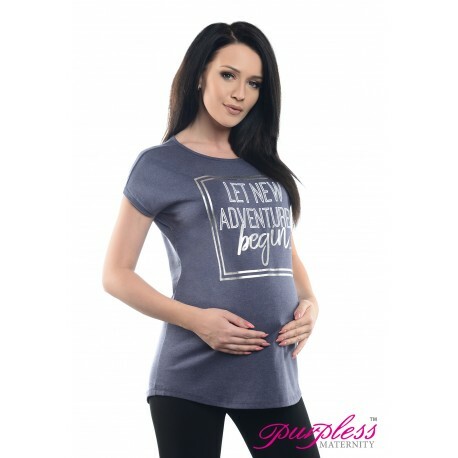 Purpless Maternity Slogan Print Boyfriend Fit Pregnancy Top 2201 Graphite Melange Tick all of your maternity fashion boxes with our boyfriend fit bump-friendly t-shirt. Modern silver slogan print, short sleeves and crew neck go with everything. Made with Love-Slogan Cotton Printed Maternity Top 2015 PlumRefresh your summer wardrobe and stay on trend this season with our stunning printed Top. Our stylish, short sleeved maternity top will be sure to make you stand out in a crowd. Skeleton-Slogan Cotton Gold Printed Maternity Top 2016G Black Refresh your summer wardrobe and stay on trend this season with our stunning printed Top. Our stylish, short sleeved maternity top will be sure to make you stand out in a crowd. Made with Love-Slogan Cotton Printed Maternity Top 2015 WhiteRefresh your summer wardrobe and stay on trend this season with our stunning printed Top. Our stylish, short sleeved maternity top will be sure to make you stand out in a crowd. Skeleton-Slogan Cotton Printed Maternity Top 2016 Indigo Jeans MelangeRefresh your summer wardrobe and stay on trend this season with our stunning printed Top. Our stylish, short sleeved maternity top will be sure to make you stand out in a crowd. Love Heart-Slogan Cotton Printed Maternity Top 2011 BlackRefresh your summer wardrobe and stay on trend this season with our stunning printed Top. Our stylish, short sleeved maternity top will be sure to make you stand out in a crowd. Skeleton-Slogan Cotton Printed Maternity Top 2016 BlackRefresh your summer wardrobe and stay on trend this season with our stunning printed Top. Our stylish, short sleeved maternity top will be sure to make you stand out in a crowd. Love-Slogan Cotton Printed Maternity Top 2010 WhiteGo for a statement t-shirt this season with our chic and adorable printed maternity LOVE t-shirt. T-shirts are made of comfortable and soft cotton and will last through out your pregnancy. Pair it with our maternity leggings or your favourite pair of skinny jeans and boots. Available in 4 colours.